A diverse array of Atlanta's community leaders will unite at the IBEW Building on Thursday morning to stand in opposition to Senate Bill 469 - a politically-driven bill intended to intimidate Georgia's working families. The bill, which would criminalize certain kinds of economic justice pickets, will burden public safety officers, who are already contending with reduced resources due to budget cuts and overcrowded jails. When: Thursday, March 1 at 11:30 a.m.
Atlanta JwJ Co-Chair Ben Speight talks about SB469, what Rick is calling the Shaft Heardless Bill. For decades unions have been banned from secondary boycotts but individuals have been able to have personal boycotts. 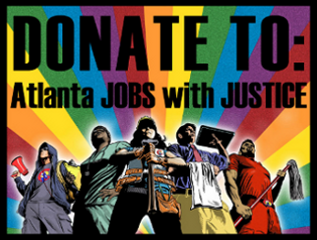 With Occupy Wall Street joining the fight for jobs at AT&T the state of Georgia is fighting back and attempting to put massive fines and turn civil disobediance into a felony. The even most sickening part is Georgia is a three strike state. In a state which lays credible claim to being the cradle of the Civil Rights movement, State Senators Don Balfour, Ross Tolleson, Bill Hamrick, and Bill Cowsert have just demonstrated palpable disrespect for Georgia’s rich history of protest and activism. They are the sponsors of Senate Bill 469 which, had it been law in 1960, would have made Dr. Martin Luther King, Jr., Rev. Dr. Joseph Lowery, John Lewis, Joe Beasley, Minnie Ruffin, and many other luminaries of the Civil Rights movement into felons. Along with provisions intended to stealthily de-fund and weaken unions, the law as proposed would make picketing illegal “at or near any place where a labor dispute exists in such number or manner as to obstruct or interfere with or constitute a threat to obstruct or interfere with the entrance to or egress from any place of employment or the free and uninterrupted use of public roads, streets, highways, railroads, airports, or other ways of travel, transportation, or conveyance.” That is, you don’t have to actually block the entrances or sidewalks; you merely have to seem like you might. The “offense” of picketing…protected under the First Amendment and enshrined in our history as far back as the public outcry against the Tea Act which led to the Boston Tea Party protest and the American Revolution…would be punished by a $1000 fine per day per person, and a $10,000 fine per day for any organization participating. Even more egregiously, SB 469 would make “conspiracy to commit criminal trespass” into a felony. Criminal trespass is a misdemeanor; it is also the crime with which sit-down protesters at a place of business are typically charged. In other words, SB 469 seeks to turn peaceful demonstrations into felonies. If that law had been on the books during the Civil Rights era, then the people who organized and participated this sit-down protest of the downtown Atlanta McCrory’s and F.W. Woolworth in November 1960, this protest of Leb’s Restaurant and S&W Cafeteria in May 1963, this protest of Toddle House Restaurant in December 1963 at which John Lewis was arrested, would all have been in danger of being charged with felonies merely for organizing a peaceful protest. At the beginning of an interview from October 1960, Dr. Martin Luther King, Jr. speaks of the usefulness of sit-down protests in bringing about the end of segregation. (All clips from the Civil Rights Digital Library, University of Georgia). 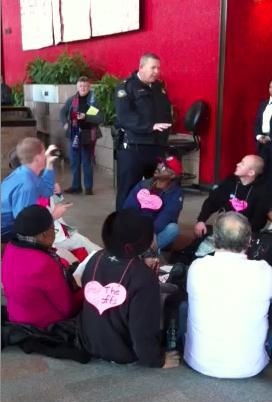 The time-honored approach of peaceful sit-down protest has been used by Occupy Atlanta during the raid on our park encampment in October, at Chase Bank on February 10, and most recently at AT$T on February 13 along with members of Georgia Communication Workers of America and Jobs With Justice. A week and a half after the AT$T action, SB 469 was introduced by four corporate lap-dogs in the state legislature. This is blatantly targeted legislation, in violation of all of our traditions of democracy, free speech, equality before the law, organized labor, and individual rights. SB 469 is corporate rule and political corruption in action. Join us on Wednesday, February 29 at the Georgia State Capitol Building at 9:30 am to let your voice be heard. If you can’t afford your own state senator like AT$T, bring a sign. Help AT&T Workers With One Call!! Today AT&T workers have been summoned to a meeting at AT&T’s Atlanta headquarters, located at 675 West Peachtree St. It is there, in this meeting, where they will be given notice of their official layoff date. Being told you are being laid off is almost always devastating, but in these economic times it can be downright terrifying. With unemployment, foreclosures, and homelessness at record rates, being jobless in this city is no easy feat. To add insult to injury, AT&T had record profits last year, pulling in over $127 billion in revenue, and compensated their CEO, Randall Stephenson, over $27 million. 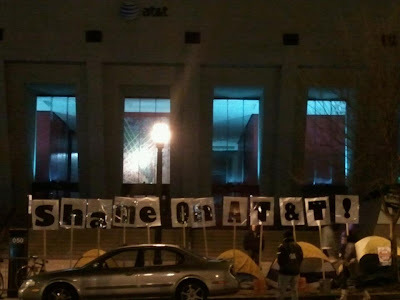 Last week, Occupy Atlanta set up an encampment in front of the building at 675 West Peachtree St to demand AT&T put a stop to these layoffs. We are committed to staying put until all the layoffs are rescinded, and/or all 740 workers will have wage/benefit protection if they are moved to new positions. AT&T has claimed that these workers will be given new job offers, but according to many of the workers, this is news to them. Those who are aware of the new offers, are being asked to take positions with considerably less pay and benefits. This is exactly how wealth consolidation works. 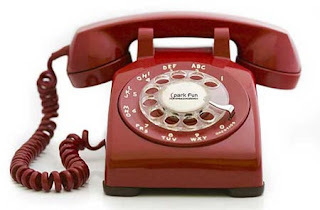 What’s happening at AT&T is symbolic of what has been happening all over the country for decades. The 1% wants to lower the standard of living for the average American worker, all so that they can pocket some extra cash. We can no longer allow them to squeeze every penny they can out of the 99%. The 99% creates the wealth; it is made on our backs. It’s time these big wigs stop getting handouts they don’t need while everyone else suffers. Stop the Lay Offs! AT$T. AT$T Occupation. Measuring Our Power Part 1. Today marks the 5th day of the AT$T Occupation. Today marks the 5th day that AT$T's four main public doors have been locked to the public due to the organizing hub developing right at AT&T's doorstep. Over 19 tents can be found neatly lined up along the sidewalk, care has been taken to allow enough space for people to walk by and to remain a completely legal occupation. The tents are weighed down at all four corners with rocks wrapped in plastic bags. The bags are used to ensure that the rocks do not rip the tents, while the weight is needed because urban occupations often do not have soft ground to stick tent stakes into for stability. Signs are posted that state "No Drugs or Alcohol". This Occupation is family friendly and is a safe space for our community members. Community members continue to support the occupation with food and moral support. The CWA brought out tarps, water, socks and blankets. The support shown from different sectors of our city is truly what building a community is all about. We need jobs not cuts and we're willing to stay as long as it takes until AT$T chooses to respect our community and sit down and negotiate with the CWA. It should be noted that the longer AT$T waits the more time that we have to organize and escalate. If they are worried only about the 675 building it would be naive of them. 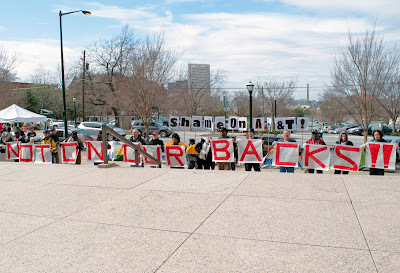 Following the arrest of 12 activists on February 13th, Jobs with Justice, the CWA and Occupy Atlanta returned in force to the hub of AT&T in the South. Over 300 unionists and community members surged onto the private "courtyard" in-front of the AT&T 675 West Peachtree building which immediately caused the 4 entrances of the building to be blocked and barricaded by AT&T management. The building remained locked for most of the day shutting down business as usual. Occupiers settled in in front of the building on the public side walk throughout the night of February 13th. The tents shine a bright spotlight on the corporate greed of AT&T threatening to layoff 740 hardworking community members. During the mobilization on the 14th, occupiers proclaimed that they would continue to build the occupation until AT&T rescinds all of the 740 lay offs. A CWA member member then proudly took the mic and stated "I've got a tent and I'm going to camp here until these layoffs are rescinded." 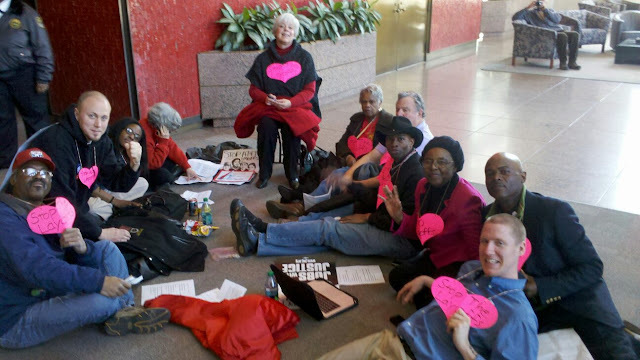 Today, 12 individuals from Atlanta Jobs with Justice, Communications Workers of America (CWA), and Occupy Atlanta were arrested in an act of civil disobedience that called on AT&T to rescind the order for 740 AT&T layoffs. This action is a result of AT&T's announcement that it was necessary to layoff 740 service technicians followed by an announcement that revenue soared in 2011 to almost 127 billion. The loss of 740 jobs not only affects each individual but the thousands of family members that they support. At a time when our country’s economy has been hit by massive unemployment and record breaking foreclosures, the CEO of AT&T is making 27million per year. This is the time to demand that the value of human life and well-being is more important than corporate advancement. Occupy Atlanta is committed to the fight for the rights of laborers and will continue to support CWA in its demands of AT&T. Tomorrow, February 14, Occupy Atlanta will stand with CWA in a rally at AT&T 675 West Peachtree St. We are asking AT&T to show their employees some love and rescind all of the 740 layoffs. Occupy Atlanta, Atlanta Jobs with Justice, Communication Workers of America, and AFSC have just entered the AT&T Atlanta headquarters and are refusing to leave until every single job cut is rescinded. Simultaneously, an occupation with tents is being set up outside of the building. Click Here to Tell AT&T CEO Randall Stephenson to stop the lay-offs of 740 southeastern workers. AT&T recently announced the "surplus" of 740 union AT&T jobs despite its revenues soaring to $126.7 billion and a CEO that made over $27 million in 2011. Multinational corporations like AT&T have been undermining workers standards of living for decades. If we stand up for union jobs with AT&T we can stand up for a future where there's enough for everyone, a future that creates space for all of us to thrive. Lift up the South, lift up this nation. Let's not get it twisted. There's enough resources to go around. The crisis isn't about resources. It's about economic priorities. It's time that the 99% stand up to the unprecedented wealth consolidation that has been robbing our communities. Together we can take these 740 jobs off the chopping block. Let this action be the beginning of a movement to put human need above corporate greed in a very real, tangible way. It's time to bring the energy from Wisconsin into the South and it's time to support the Occupy movement and concrete worker struggles across the country. Atlanta Jobs with Justice, Communication Workers of America and Occupy Atlanta, stand up against the loss of 740 jobs in the Southeast, and stand up for middle-class workers throughout the region. At a time when one of every five workers is unemployed or underemployed, we expect American businesses to do their part to keep our economy on track rather than continuing to benefit from tax breaks and corporate welfare while ordinary Americans face hardship with no end in sight. As we occupy outside, members of CWA, Jobs With Justice and Occupy Atlanta will occupy the offices of AT&T until they agree to rescind the layoffs and preserve jobs for Americans. Corporate greed is unpatriotic. We will continue to escalate if the layoffs are not immediately rescinded.